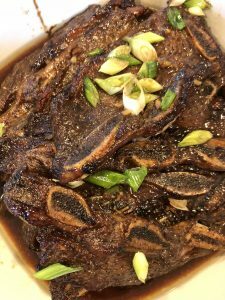 My kids latest “favorite” is Korean Food…especially my son…when he is into something…he will eat it 24/7 until he is sick of it. Well, this past weekend he wanted to go eat at this Korean Restaurant again…which will make it 3x this month…and its only the 14th LOL. Anyways, I told him…lets give that restaurant a break and spend our money at other “new” restaurant..since there is SO MANY here in NOLA. 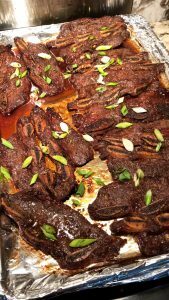 So, to talk him out of it…I told him I would make one of his favorite…Korean BBQ short ribs aka Galbi. 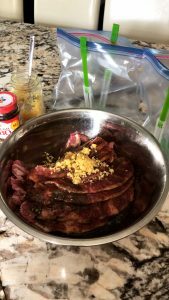 In a large mixing with…add in the Korean BBQ Marinate, then ADD ALL of the rest of the other ingredients and mix well. 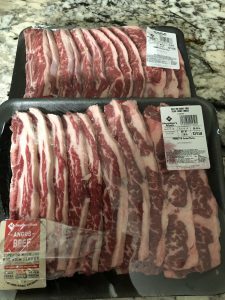 Set out a gallon size ziploc bag (taking a sharpie…label the content on the bag) so that you can place each piece of short ribs into the ziploc bag once it has been coated with the marinate. 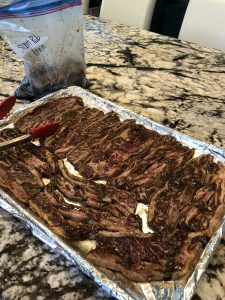 After all the short ribs are marinated and placed inside the ziploc bag…pour the remaining of the marinate into the ziploc bag. Making sure the ziploc bag is ZIPPED TIGHT. I would DOUBLE BAG it then place it in the refrigerator OVER NIGHT. Marinate in ZIPLOC bag..make cleaning up SUPER FAST. Taking a huge baking pan…line with FOIL. 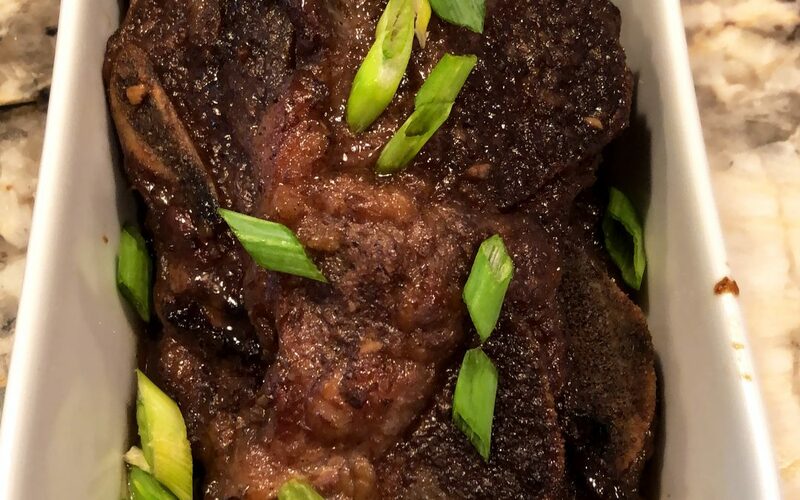 Lay each piece of short rib onto the foil. Making sure its just 1 layer. Line with FOIL. Makes cleaning super easy!! Place in the middle rack of the oven and BAKE for 20 MINUTES!!! Take out the oven and let it rest a few minutes. Garnish with sliced green onions. Serve HOT with jasmine white rice or with some baguette. I love dipping the baguette into the sauce. I made this last weekend & my husband loved it! YAY!!!! Thank you for letting me know!!! <3 That you for being such a loyal subscriber to my blog! !